Today I have for you a nice light summertime cake. I’m not one to make too many cakes. The reason being is it’s to hard to eat with just two people in the house. But today’s cake is an exception to the rule. Plus I bought two new cake pans and I had to use at least one of them. he he Anyway, this cake is so light and fluffy and perfect for an after dinner dessert that is not to heavy. 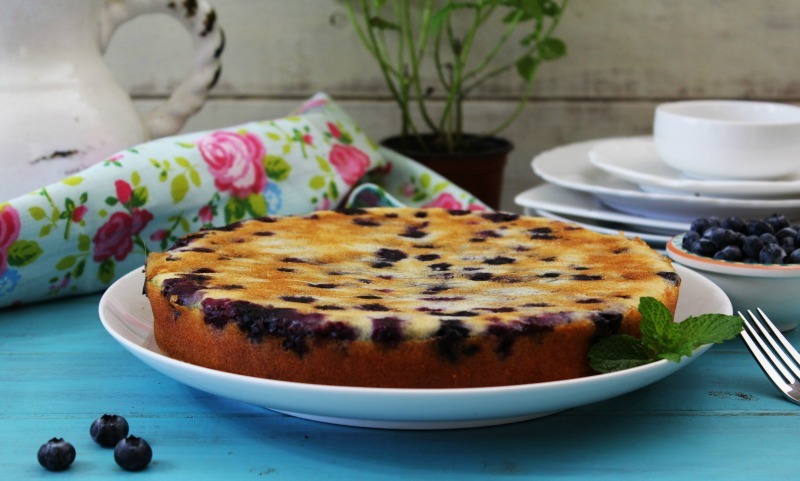 Today’s recipe is Blueberry Cake. 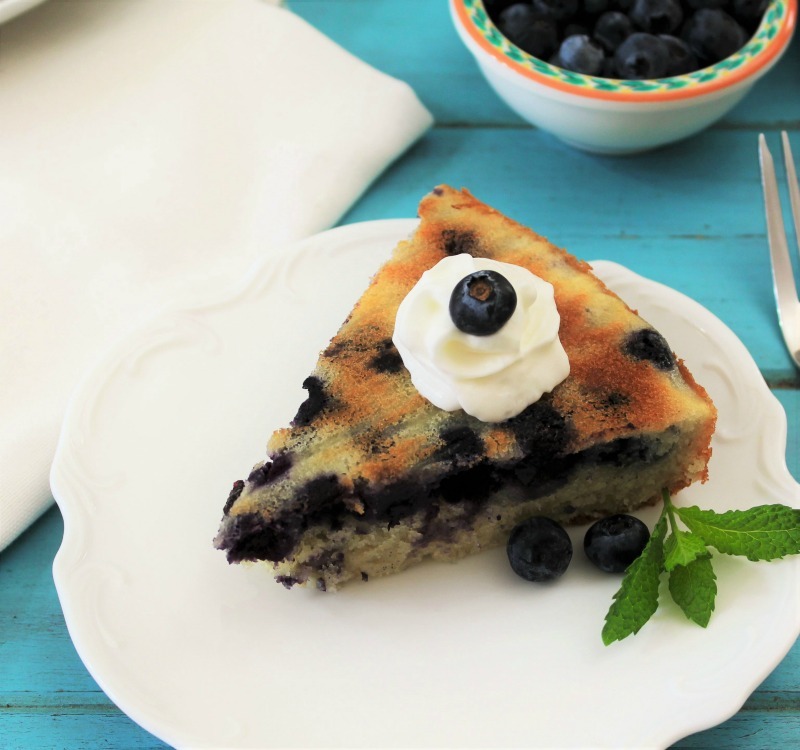 The cake has a nice vanilla flavor chocked full of blueberries. The blueberries just pop in your mouth. I skipped the frosting on this cake because for one, I’m not a frosting person and two the cake has enough flavor to stand on its own. Feel free to add a nice lemon glaze over the top. I added that to the recipe just in case you want a glaze. I served it with just a little bit of whip cream. 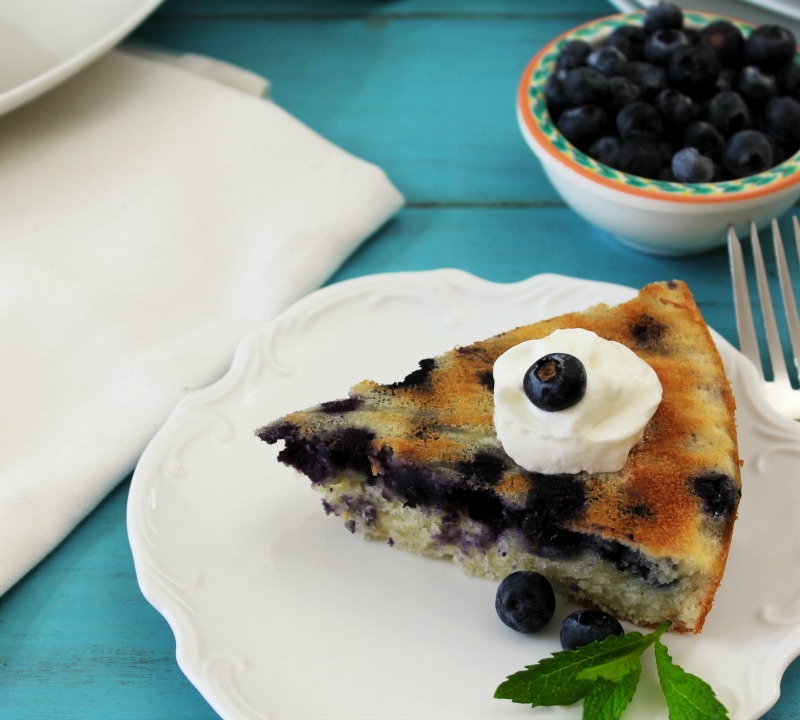 I added frozen blueberries to the cake to prevent it from turning blue with fresh berries. I took everyone’s advice and put my blueberries in a little bit of flour so the berries wouldn’t sink to the bottom. But they still did. I don’t understand why? So I served the cake upside down. Now the blueberries are on top. They look so pretty too. Each bite you get a nice blueberry or two. My Husband just loved the cake. He ate half of it when I was photographing it. It’s so moist and very quick to make too. It came out fluffy because I used cake flour instead of regular flour. However, I have made it with all-purpose flour and it still turned out just as great. 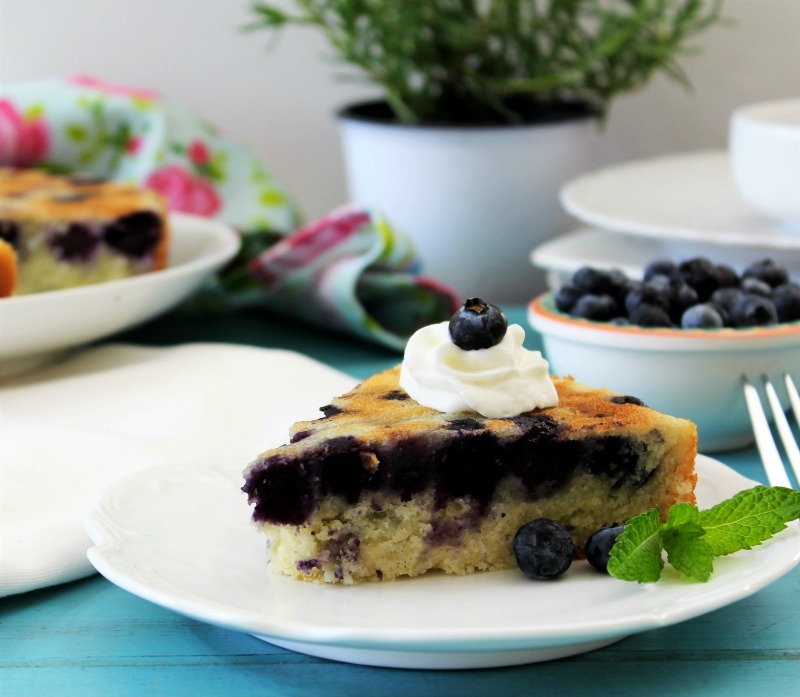 I think if you are a blueberry fan, you will love this cake. 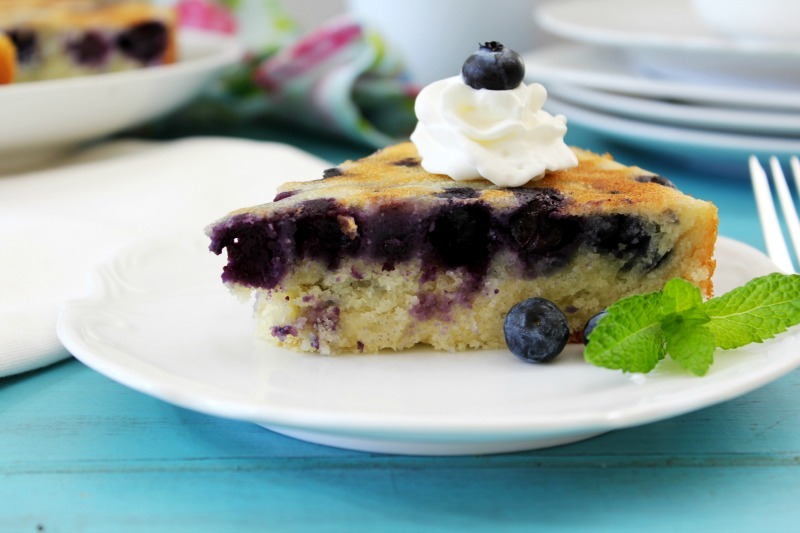 Light fluffy vanilla flavored cake chock full of blueberries and low in sugar. Line the bottom of a 9" round cake pan with parchment paper. Rub pan with butter. Set aside. In a medium bowl add cake flour, baking powder and salt; mix until combined. Set aside. In a marge mixing bowl, beat together butter and sugar until light and fluffy; about 2 minutes. Mix in egg one at a time until incorporated. Add vanilla extract until combined. With mixer on low speed; alternate flour mixture and milk into batter until combined. Pour batter into prepared cake pan and bake for 30 - 35 minutes until the center comes out clean with a toothpick. Let cool in pan for about an hour. Take a plate and place over the cake and flip cake onto plate. Peel off parchment paper. Serve when cake is cooled. 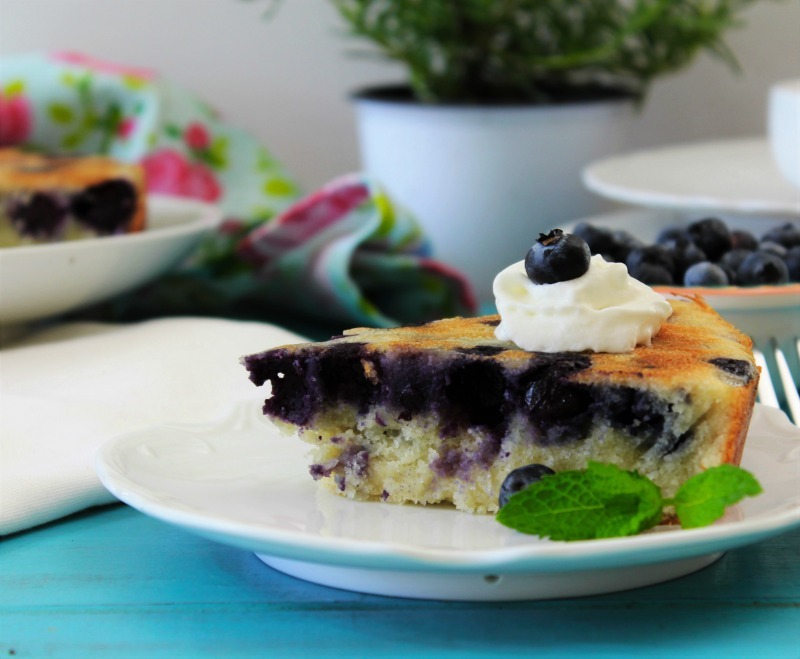 Optional topping: Mix together 1 cup confectioners sugar with a tablespoon of lemon juice and add glaze over cake. For the recipe I didn’t use that much sugar in it. Most cakes take almost 2 cups of sugar, I went with 2/3’s of a cup, which is just perfect. I didn’t want anything overly sweet. Feel free to add a pinch more, but I don’t think you will need it. It’s really fun making cakes. I enjoyed making it and I enjoyed eating it even more. 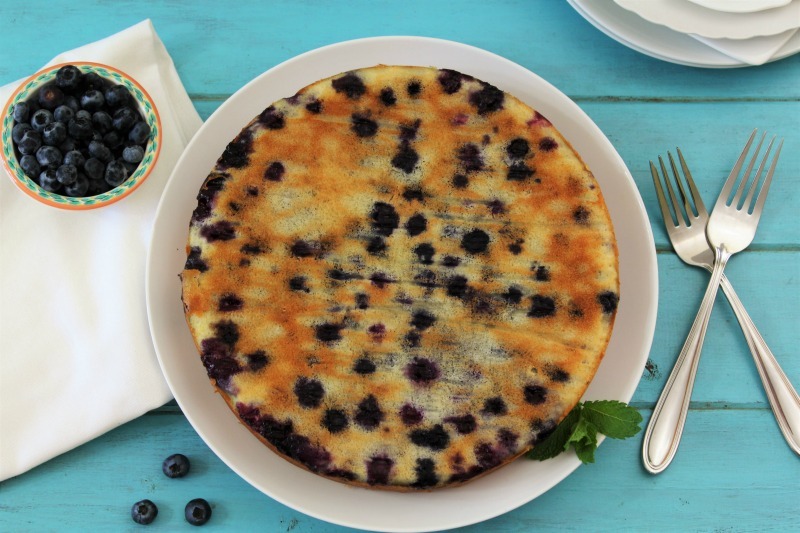 So if you have some summer blueberries, make this cake. You won’t regret it.